Shimmerz Paints: Truly Loving the Shimmerz! The base is a black 7 Gypsies Artist Painter's Tray which I was finally able to order, and I since it was the only one I could find at the time, I wanted to make something special with it. 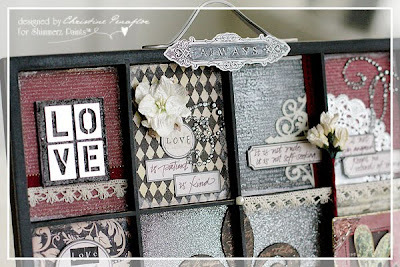 I sprayed the black and white text background papers and flowers with Baby's Breath Spritz. I inked the edges of the patterned papers with Before Dawn Vibez and added a hint of Gold Glimmer Blingz to the edges as well for highlighting. I just love how all of the Shimmerz products combine to truly make this project shine! 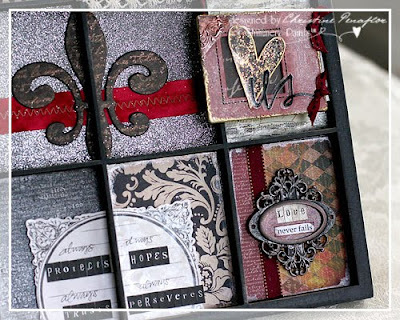 The fleur de lis chipboard piece was painted black, sprayed with Before Dawn Vibez, stamped with a script stamp and highlighted with copper mica powder. Finally, I wanted to add a bit of color to the Tim Holtz metal nameplate so I used a sponge to dab on some Penny Pincher Vibez to highlight the scroll work around the nameplate. It turned out beautifully! 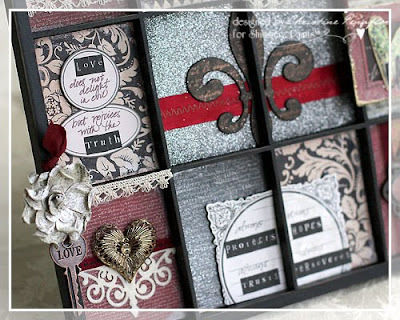 I hope that you're inspired to create something that shares your love story, too! Thanks so much for visiting today! Very nice! Love the scripture verse and the TH embelly. Also love the metal heart!! Gorgeous! This is beautiful, I love it! Thanks for sharing! Oh Christine!!! I love this project. The colors, the verse and all the textures. It's very, very special. So beautiful!!! 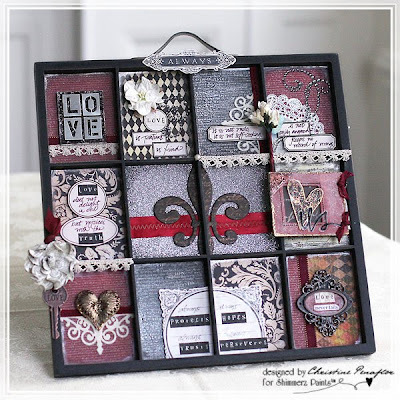 Oh this is sooooo pretty..I have one of these sitting in my scrap room and now you have inspired me to get to work on it!!! LOVE IT!!!! Thanks for sharing with us!!! What a gorgeous work of art!! Perfection! Oh wow! That is just gorgeous! Really love the way you embellished the giant fleur-de-lis!